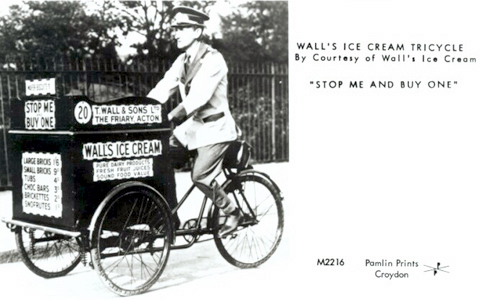 The first ice cream bicycles in London were used by Walls in London in about 1923. Cecil Rodd of Walls came up with the slogan “Stop Me and Buy One” after his experiments with doorstep selling in London. 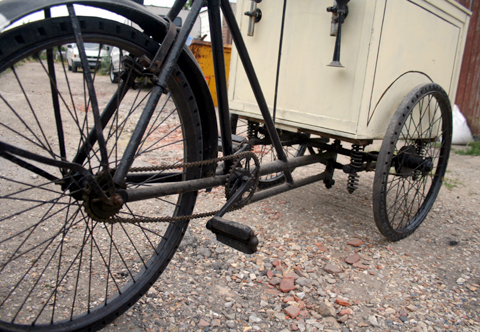 In 1924 they expanded the business, setting up new manufacturing facilities and ordering 50 new tricycles. Sales in 1924 were £13,719, in 1927 £444,000. During the war years (1939-45) manufacture of ice cream was severely curtailed, and the tricycles requisitioned for use at military installations. 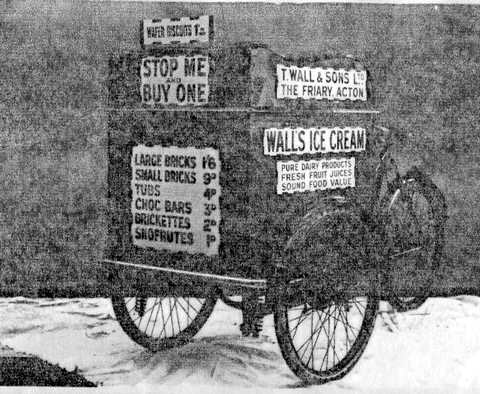 In October 1947 Walls sold 3,300 tricycles and invested in freezers for shops. In 1940, staff and pupils of Lancing College were evacuated to Shropshire. The War Office then requisitioned the school buildings and HMS King Alfred, the Royal Naval Voluntary Reserved moved in. The buildings were soon put to use, the chapel became their “stone frigate”. 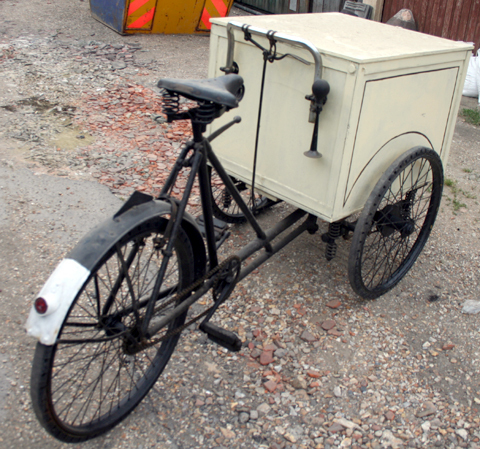 The Admiralty had purchased about 18 Walls Ice Cream “stop me and buy one” pre-war tricycles which were converted into little ships (with the addition of a chart table and compass above the former ice-cream cool box). Pedaling around a mini English Channel laid out with buoys on the cricket field at Lancing College, the naval ratings learned the art of navigation and within a few weeks were at sea. Truly an example of necessity being the mother of invention! The Warrick box tricycle featured here is owned by my friend Alan Bond. It is in excellent roadworthy condition, and he often takes it to shows. When I recently visited a friend, Tony, in Gosport, for our annual exchange of vehicles from our collections. 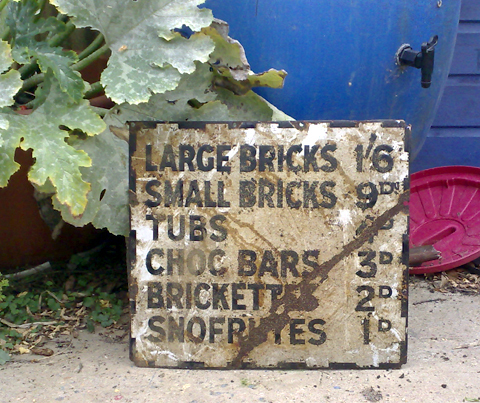 I was surprised to spot this Wall’s Ice Cream Trike sign lurking among his knick-knacks. It came from an old Warrick box-trike he owned when he was young. This is most likely all that’s left of it now. 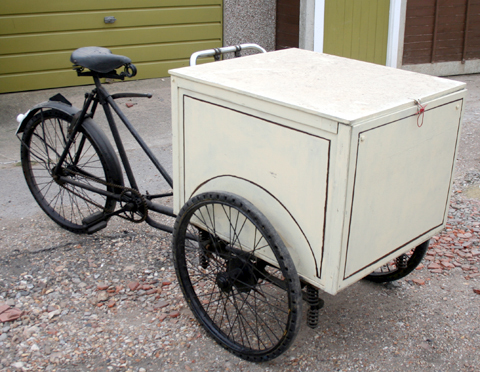 My Warrick Ice Cream trike can be seen below and, on the next page, you can compare it to the Pashley box-trike. This superb ‘Stop-Me-and-Buy-One’ Walls box-trike is owned by Greg Warrick. It’s pictured here at his home. The ‘wafer biscuits’ sign is stored inside the box when being ridden. The trike was ridden on the London-Brighton vintage bicycle run some years ago. The large bell was used to announce its arrival. Though we’re no longer familiar with bells, whistles or calls outside our windows to herald the arrival of passing vendors, visitors to Asia will no doubt recall that this practice still exists in many other countries. The lid on top of the ice cream box is different on mine. I assume there was some variation over the years of production. The saddle is comfortable, a useful criterion if you have to sit on it most of the day. 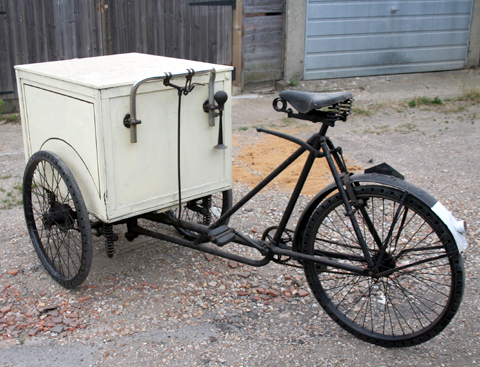 This box-trike lived for many years at Christchurch Tricycle Museum in Hampshire. PATENT SPECIFICATION No. 505,966. APPLICATION DATE: October 31, 1938. SPECIFICATION ACCEPTED: May 19, 1939. TITLE: IMPROVEMENTS IN AND RELATING TO MOTOR PROPELLED TOY VEHICLES. The present invention relates to clockwork motor propelled toy vehicles of the kind representing tradesmens’ delivery vans, ice cream tricycles and the like, and having a hinged topped or lidded box like portion for containing the goods.